Looks: Ishizu's straight black hair trails just below her shoulders and features 2 locks wrapped in gold beads coming from behind her ears and continue in front, stopping at her neck. She is slender in build and has tanned skin. She wears the Millennium Necklace around her neck prior to giving it to Yugi. Ishizu's first outfit consists of a long ankle length dress partially bearing her shoulders featuring gold patterns around the neck and the rims of the sleeves. Her jewellery consists of a gold piece of headwear circling her head and featuring an emerald where it meets at the front. History: Ishizu's family guarded the tomb of the Pharaoh for generations and 2 of the Millennium Items: the Millennium Rod and the Millennium Necklace, which were were passed on to Ishizu and her brother Marik. Marik, who was forbidden to leave the Pharaoh's tomb because it might divert his attention away from his heritage, convinced Ishizu to let him take a trip outside. Marik no longer wanted to become a Tomb Keeper and when he was forced to take the initiation ritual to become a full Tomb Keeper, he unwillingly unleashed Yami Marik, who took the Millennium Rod for himself. In the Battle City, Ishizu is the Secretary General of the Egyptian Supreme Council of Antiquities. She became a museum curator in order to lure Yugi Muto and Seto Kaiba in order to save Marik from his darker alter ego, Dark Marik. She gave Kaiba the Obelisk the Tormentor card in exchange for him starting a tournament, where he could acquire the remaining God Cards, but told him that regardless he would end up returning the card. She had predicted this using the power of her Millennium Necklace. Ishizu qualifies to the Battle City quarter-finals, where she duels Kaiba. She predicts all Kaiba moves and foresees her victory, but an unknown instinct tells Kaiba to summon his Blue-Eyes White Dragon. Kaiba follows claiming he makes his own future and tributes Obelisk the Tormentor to play Blue-Eyes hence avoiding his defeat. Following her defeat Ishizu gives the Millennium Necklace to Yugi claiming she no longer needs it because it no longer responded to her as the future it showed her was changed by Kaiba. During the finals where Yugi faced Marik, Odion convinces Marik to accept responsibility, freeing him from Dark Marik. Ishizu and Marik are then able to fulfill their duties as Tombkeepers, by revealing the Pharaoh's memory which had been carved (tattooed in the English anime) onto Marik's back. Ishizu, Marik and Rishid then return to Egypt to start a new life. 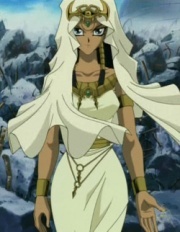 After the Pharaoh recovers his memories and his name in the Egyptian Arc, Ishizu, Marik and Odion lead Yugi and his friends to the tomb of the Pharaoh in order for Pharaoh Atem and Yugi to have a final duel in order to determine if the spirit will move on to the afterlife or remain in the present. When the duel is over and the tomb is destroyed, Ishizu states that her family's duties as the Pharoh's tomb keepers are finally complete since his spirit has returned to the nether world and the Millennium Items have been sealed forever.